What sets mankind's closest relatives — monkeys, apes, and other primates — apart from other animals? According to a new study, one answer is that primates are less susceptible to the seasonal ups and downs — particularly rainfall— that take their toll on other animals. The findings may also help explain the evolutionary success of early humans, scientists say. The study appeared online in the November 30 issue of American Naturalist. "Wild animals deal with a world that's unpredictable from year to year," said study lead author Bill Morris, a biologist at Duke University. "The weather can change a lot; there can be years with plenty of food and years of famine," he explained. 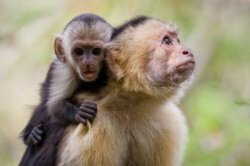 To find out how well primates cope with this unpredictability compared with other animals, researchers working at the National Evolutionary Synthesis Center (NESCent) in Durham, N.C. analyzed decades of birth and survival data for seven species of wild primates: muriqui monkeys and capuchin monkeys in Central and South America, yellow baboons, blue monkeys, chimpanzees and gorillas in Africa, and sifakas (lemurs) in Madagascar. Collecting this data was no small effort. Nearly every day for more than 25 years, seven research teams working around the world have monitored the births, lives, and deaths of thousands of individual primates. Thanks to a new database developed at NESCent, the scientists were able to pool their painstakingly-collected data and look for similarities across species. When they compared year-to-year fluctuations in primate survival to similar data for other animals — namely, two dozen species of birds, reptiles, and mammals — they found that primate survival remained more stable despite seasonal variation in rainfall. "Primates appear to be well buffered against fluctuations in weather and food availability relative to a lot of other animals," said co-author Susan Alberts, a biologist at Duke University and associate director at NESCent. A number of traits may help shield primates from seasonal ups and downs. "For one thing, they're social," said co-author Karen Strier, an anthropologist at the University of Wisconsin-Madison. Primates live in groups and share information with each other, so they're better able to find food and water in times of scarcity, Strier explained. Primates also owe their adaptability to broad, flexible diets that enable them to adjust to seasonal shortages of their favorite foods. "Primates will eat leaves, grasses, fruits, flowers, bark, and seeds. They're generalists," said Alberts. In the distant past, similar traits may have also buffered other primates — namely, humans — against environmental ebbs and flows, scientists say. "Modern humans have all the same traits these primate species have: we're smart, we have social networks, and we have a broad diet," said Morris. "Modern humans also arose during a period when Africa's climate was changing," Morris added. "So the same traits that allow non-human primates to deal with unpredictable environments today may have contributed to the success of early humans as well." If primates are good at coping with environmental ups and downs, then why are so many of them now endangered? Despite being well buffered from changing weather, human activities still take their toll, the scientists say. With nearly half of the world's primates now in danger of becoming extinct due to hunting and habitat loss, continued monitoring will be key, Strier added. "Everything we can learn about them now will help prevent their extinction in the future."